20x25x5 Merv 12 Honeywell Replacement Air Cleaner Furnace Filter , selling for $38.00 brand new. Manufactured by Dead Sea Spa Care. There are 1 units left brand new. Air Demon Filter Media #142-304-800, Duracraft 52025, Lennox X6675 and others. We please ask that you CHECK THE EXACT MEASUREMENT OF YOUR FILTER TO MAKE SURE THIS FILTER WILL WORK FOR YOUR UNIT PRIOR TO ORDERING. 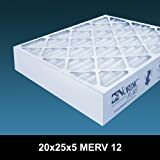 Our Honeywell Replacement Air Cleaner Furnace Filter 20x25x5 Merv 12, single air filter is the best air filter you can find to improve air quality. The actual size of our Honeywell Replacement Air Condition/Furnace Air Filters is 20 x 24 7/8 x 4 1/8. Why will it improve air quality? Well for one, compare the 20 Pleats in our furnace filter instead of the usual 16-18 pleats. Secondly, you have the benefit of MERV 12 efficiency instead of MERV 8-11. Our non-woven synthetic filter media in our air cleaner furnace filter will not support the growth of mold or bacteria, keeping your air space healthier. Our filters use permanently charged electrostatic material that helps dust cling to the filter. Our anti-allergenic Merv 12 pleated air condition filters significantly reduce dust and dust mites in home, mold spores, pet dander, pollen, smoke particles, and other airborne particulates by up to 97.8%. This Honeywell replacement filter will improve your indoor air quality, may reduce dust in your home and your indoor allergy may less when capturing the smaller particles and contaminants. Our filter material has a permanent electrostatic charge and does not support the growth of bacteria, fungi, mildew or mold.